Last week we changed the clocks, “spring forward”, shifting the hours to catch more afternoon sun. As the daylight slowly widens toward the solstice, we strive to let the natural light linger, to grasp its presence. Several weeks ago we gathered as a community in a mountain cabin by the river to learn and explore how we might deepen the ways we talk with one another, particularly how better to have difficult conversations. We looked at the ways in which the stories we tell ourselves shut us off from hearing and receiving the truth of another person. We practiced ways to ground and center ourselves in order to be able to cross the gulf and open the gates between us. I think most of us came away with the realization that we had a long way to go. Our efforts are often so far from our hopes. 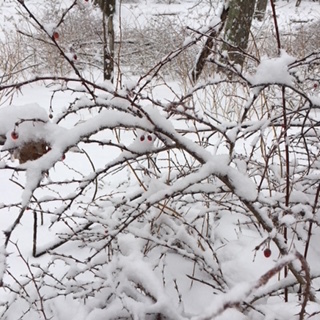 This past weekend, some of us were part of a five-person crew that tugged, and strained, and dug at the roots of invasive barberry bushes while the sky clouded over and a faint, sleety snow filled the air. Of the hundreds of barberry bushes in our 1400-acre woods, the crew working all day pulled out, in Billy’s estimation, “a bunch,” leaving many more bunches in place. It will be a long time before the forest is free of barberry, before the understory returns as the vital seedbed of a healthy forest, before we humans are restored to a sense of belonging to the planet and connection with one another. For some years I have been fascinated with the power of story to illuminate our experience. When seen from a perspective of mythic story, our shortcomings just might be good news. Scholar and storyteller Michael Meade explains why when he says, “There are old stories that show that if the world was ever completed, was ever made perfect, that would be the end of [things]…this world and each person in it remains an unfinished project, and remains because of being incomplete….the impossible tasks, the broken hearts, the utter failures actually sustain the world.” Strange as it may seem, our flaws, discords, and long, perhaps even unreachable goals are what make our projects viable and strengthen our community. The frays in our hopes and plans are what catch the light. At Keith’s suggestion, I listened to an interview with Padraig O’Tuama, the community leader of Corrymeala, Northern Ireland’s oldest peace and reconciliation organization. In the interview, Padraig related humorously that when the community was named Corrymeala people thought the name meant “Hill of Harmony”, and they were delighted, thinking the name charmingly appropriate. About a decade later, someone with better knowledge of old Irish etymology pointed out that the name actually means “Place of lumpy crossings,” which is a far more accurate description of community. Rough waters are where we learn to stay afloat, to trust one another, to make it together across an unknown sea. Right now the cracks are everywhere: in nature, culture, politics, and in our relationships and great divides. The cracks are canyons. Yet I look around and see us, still here, still showing up with all our imperfections, our shadows and bruises. I know that at the next work day, or tomorrow, we’ll be back at it again pulling out barberry bushes, planting woodland gardens, homeschooling, marching with high school students in Washington DC, teaching students with behavioral disorders; and striving to hold difficult conversations. All across the planet, millions are doing the same, imperfectly stumbling bit by bit toward ever-receding horizons. There is grace in this. That’s how the world goes on. That’s how the light gets in.